I am not nearly eloquent enough to tell you how much I appreciate and value the reception given me at our reunion. To say that your respect and generosity were the high point of my year does not begin to relate to how I felt and continue to feel. Perhaps once in a lifetime people whom you respect and admire treat you with such kindness, I can now say that I have had that once in a lifetime. 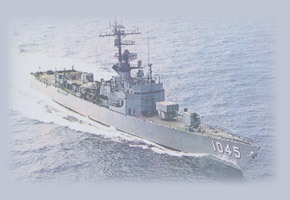 Upon completion of our WestPac cruise in 1967 I stated in the cruise book: "I will always consider it my greatest privilege to have served with the men of the DAVIDSON as we strove to bring her to her place in the nation's service. Through the devotion and diligence of many men, she has become a ship we can all be proud of." Not only what had been accomplished then but what has been accomplished since has more than confirmed my pride. 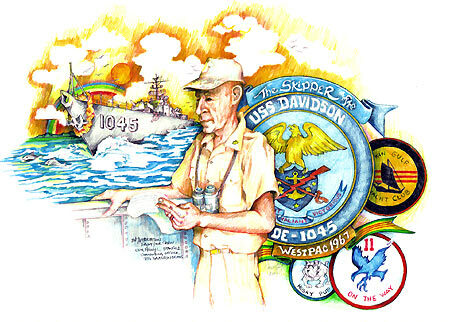 You all have established DAVIDSON's place in the best of the best of the many ships in the history of our Navy. In closing, I, "Henry", especially want to compliment and thank Robert "Tweetie Bird" Schippers and Russell "Sounds Good" Crosby for their enterprise and hard work in the historical collections, web site and reunion preparations. We all owe them a debt of gratitude for keeping DAVIDSON alive and bringing many of us together again. “Only a seaman realizes to what extent an entire ship reflects the personality and ability of one individual, the Commanding Officer. To a landsman, this is not understandable, and sometimes it is even difficult for us to comprehend, but it is so. A ship at sea is a distant world in herself and, in consideration of the protracted and distant operations of the fleet units, the Navy must place great power, responsibility and trust in the hands of the leaders chosen for command. In each ship there is one man who, in the hour of emergency or peril at sea, can turn to no other man. There is one who alone is ultimately responsible for the safe navigation, engineering performance, accurate gunfire and morale of his ship. He is the Commanding Officer. He is the ship. This is the most difficult and demanding assignment in the Navy. There is not an instant during his tour of duty as a Commanding Officer that he can escape the grasp of command responsibility. His privileges in view of his obligations are most ludicrously small: nevertheless command is the spur which has given the Navy its great leaders.